All of Germany froze over during the cold spell on Christmas 2014. The winter with its “evil, evil snow” had conquered the land, so it goes in countless tweets that include the hashtag #SCHNEEGIDA. Der Schnee (snow) has been the subject of countless sassy, ironic, and imaginative mock tweets that take the anti-Islamic and xenophobic PEGIDA movement for a ride. 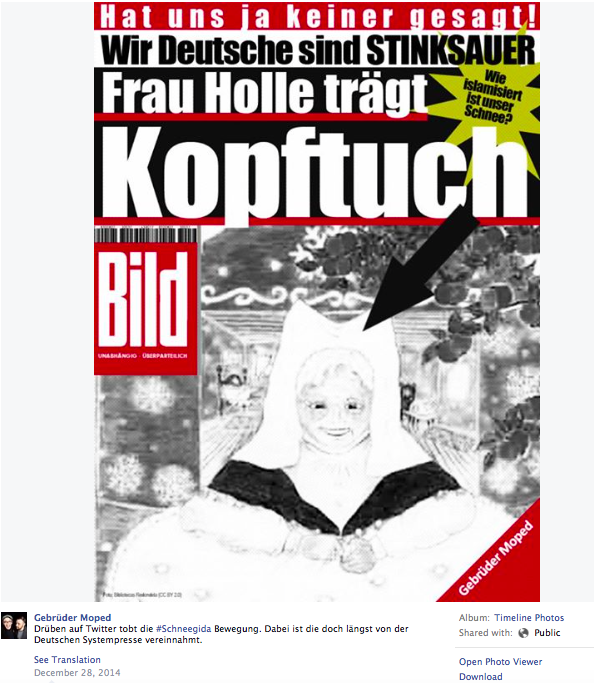 Schneegida is one of many counter movements of internet users that sharply criticize the recent flare-up of discrimination of minorities in Germany, translating fundamentalist speech patterns of exaggeration and fear mongering into something trivial, like snowing, and hence deflating the heat of the situation with humor. #SCHNEEGIDA trends at the top and even beats out the movement from which its name is derived. PEGIDA (Patriotische Europäer Gegen die Islamisierung des Abendlandes) translates to Patriotic Europeans against the Islamization of the West and is a German far-right political movement founded in Dresden in early 2014. Its Facebook account was created in November 2014 and has received over 100,000 likes within two months. PEGIDA uses its Facebook and Twitter pages to organize public demonstrations in large German cities every Monday against what it considers to be a growing and dangerous Islamization of Europe. Demonstrations started with approximately 7,000 participants on December 1, 2014, and reached 17,500 on December 22, 2014. Other right-wing groups with similar aspirations also staged protests in several German cities, having gained widespread social media popularity. 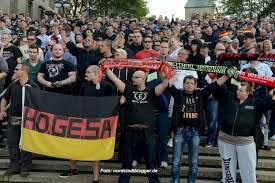 Hooligans gegen Salafisten or HoGeSa (Hooligans against Salafists), for instance, was initiated in early 2014 as a Facebook and Twitter movement by self-proclaimed fans of rival soccer clubs, who argue against the presence of outspoken Salafists in Germany. HoGeSa‘s Facebook page has received 40,000 likes within a year and has been organizing some sporadically violent gatherings in larger German cities. Opposing voices to these views have become louder and louder tuning out much of the extremist rhetoric. In her New Year’s address for 2015, German Chancellor Angela Merkel condemns any discrimination based on skin color and religion, and appealed to German citizens not to follow people whose hearts are cold and often full of prejudice and hate. Merkel emphasized that her country will continue to accept immigrants seeking refuge in Germany. These sentiments are echoed in the online petition Für ein buntes Deutschland (for a colorful Germany), which was started on December 12, 2014, and had 400,000 signatures by January 11, 2015. Some religious and non-religious organizations have also voiced their opposition. The Catholic administration of the Kölner Dom (Cologne’s cathedral) showed its opposition to the local KÖGIDA (Köln-PEGIDA) by switching off the floodlights of the cathedral on the night of the protests in order to deny the demonstrators a historic and cultural backdrop. According to cathedral provost Norbert Feldhoff, extinguishing the lights should set a conspicuous signal against “xenophobia, exclusion, and racism.” Similar reasons where given by Dresden’s historic Semper opera house for extinguishing its outdoor lighting during PEGIDA demonstrations. The opera house also positioned flags outside the building that read: “Open your eyes”, “Open your hearts”, and “The dignity of the human being is inviolable,” which is the first line of German Basic Law. These actions inspired the Facebook movement Licht aus für Rassisten (lights off for racists) that asks private homes and businesses to switch off all interior and outside lights along the routes of the PEGIDA protesters. The picture of Europe at night on Mondays shows SCHNEEGIDA’s impression of a globe with a completely blacked out Germany during the protests. While Chancellor Merkel’s speech and the lowering of the lights are powerful stances against extremism, they nevertheless remain largely ideological and symbolic. Not surprisingly, social media has been immensely successful in mobilizing counter-demonstrations on German streets and have attracted more people than the opponents of Islam’s protests. On December 12, 2014, the counter demonstrators in Munich outnumbered the 40 MÜGIDA (München-PEGIDA) protesters by 12,000. Some citizens even see a parallel between PEGIDA’s rhetoric and Nazi propaganda during WW2. A new Gegen Nazis (anti-Nazi) app was released for Android and iOS in December 2014. 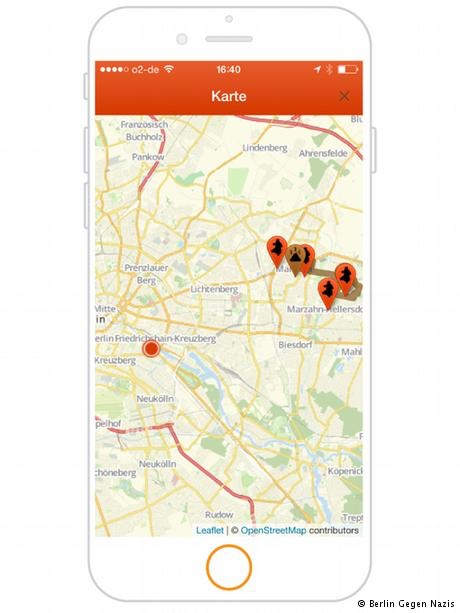 Designed as an interactive map, the app helps citizens of Berlin to find upcoming PEGIDA protest routes and to organize counter protests to block them. The app states on its Twitter feed that it has already blocked several protests. In the app, the PEGIDA routes are shown in brown and the counter protests in orange. The app will soon include other languages besides German, English, and Turkish and will additionally cover the cities of Cologne, Bonn, Munich, and Frankfurt. It was developed by the Verein für Demokratische Kultur in Berlin (Association for Democratic Culture in Berlin) through its Mobile Beratung gegen Rechtsextremismus (Mobile Anti-right-wing-extremism Agency) in Berlin. 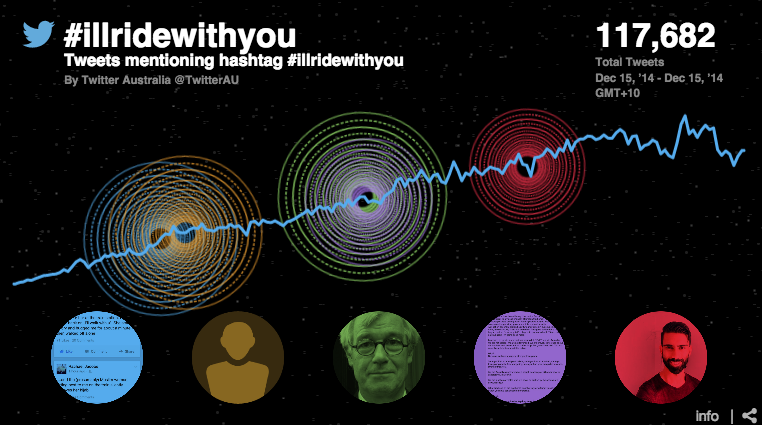 The hashtag #illridewithyou started in Australia and trended in the German Twitter sphere at the end of 2014. This hashtag emerged after the 2014 Sydney cafe siege by an alleged Islamist and morphed into a means of protecting Muslims against a potential backlash by riding with them on public transportation. Australian Rachael Jacobs posted the following tweets about one of her train rides in Sydney during the hostage situation: “…and the (presumably) Muslim woman sitting next to me on the train silently removes her hijab,” “…I ran after her at the train station. I said ‘put it back on. I’ll walk with u’,” and “maybe start a hashtag? What’s in #illridewithyou?” Sure enough, in less than 12 hours after her tweet (and still during the hostage crisis) the hashtag had been tweeted more than 100,000 times. Many Germans have been using #illridewithyou on Twitter or converted it to stickers on their backpacks to show their solidarity with the German Muslim community. But sometimes it takes a healthy dose of Kleinbürger (common-folk) humor to point out obvious flaws in PEGIDA fundamentalist rhetoric. Numerous tweeters with the hashtag #SCHNEEGIDA have been making seemingly worrisome observations about Schnee (snow), aka immigrants and refugees, exposing how irrational fears spread: individually, one Tweeter writes, snowflakes are harmless. They are even decorative, when they cover trees, or useful, when they enable winter sports. But what if it’s snowing … and snowing … and snowing? Then, one has to call the Abschiebepflug (snowplow that shovels, i.e. deports, foreigners). Other tweets mock apparent unbridgeable cultural clashes:”I have nothing against the snow in its home countries, but the German culture is, after all, rain!” and “I have nothing against snow, as long as it integrates itself and stays nice and white. But as soon as it gets yellow or slushy, AWAY!” These allusions precisely pinpoint claims to a false tolerance that is often characteristic of German fundamentalist rhetoric: non-white skin and non-Christian religions are fine, as long as they are not in front of one’s own door. The following was tweeted on December 28, 2014, by the Gebrüder Moped (Brothers Moped) — two cabaret artists who support the German counter protests from their native Austria. The picture mimics a first page story of the sensationalist German newspaper Bild. The text roughly translates to “Nobody told us! We Germans are extremely angry! Frau Holle wears a headscarf!” The yellow star reads: “How Islamized is our snow?” Frau Holle (Mother Hulda) is a German fairy tale collected by the Brothers Grimm. In the popular folk tale version — or the tale people often tell when their children ask where the snow comes from — Frau Holle is responsible for the amount of snow in the winter: the more thoroughly she shakes her pillow outside her window and hence the more feathers are tossed out, the more it snows on earth. But how can we make sense of this explosion of political opinions online and in Germany’s streets? Commentators blame societal discontentment with German immigration laws and fears that floods of immigrants will break down the national economy and societal capacity. PEGIDA and HoGeSa are quick to point out that Germany accepts the largest number of refugees, only second to the United States. Germany has received more than 200,000 applications in 2014. The influx of refugees from Syria, Iraq, Afghanistan, and several African and Balkan nations made local governments scramble to house the newcomers in old schools, gyms, and office buildings. Der Freitag’s Daniel W. calls the effectiveness of these Ressentimentbewegungen (resentment movements), in his words, a symptom of a deep-rooted and often unconscious uncertainty, as is typical for modern societies. Ressentimentbewegungen loudly voice a threat to the majority from a minority whose apparent influence in society is far greater than any numbers could show. These movements claim to defend the rights of a “lethargic” and “conformist majority” against this minority. Only the members of these movements can see the danger a minority actually poses. As such, they construct themselves as acting on behalf of a “silent majority,” the “truth,” or of “justice” and cater their rhetoric towards suggesting a fundamental restructuring of flawed policies. PEGIDA and HoGeSa present themselves as new and innovative and, at least on paper, seem to be selflessly concerned with the greater good of German society. They write that they are for a protection of the Judeo-Christian dominated Western culture and against radicalism, whether religious or politically motivated. They claim to be for the admission of refugees (but only if there is an equitable pan-European distribution), for a reduction in the number of refugees in order to support traumatized people, and for a zero-tolerance policy against delinquent refugees. The vagueness of these statements seems to compel some people to agree. Yet those who do not agree are quickly called out as naïve, at best. But #SCHNEEGIDA throws naiveté right back at them – after all, the truth is that the Eislamisierung (ice-lamization) and Islandisierung (Iceland-ization) of the West froze all of Germany, like in Reykjavik during the winter.